What do career women ‘leaning in’ at work, wage inequality, and the minimum wage all have in common? It turns out that they are all crucial for understanding how many children women have, or indeed if they have any at all. Consider a woman ‘leaning in,’ or devoting all of her energy to her career.1 Historically, these women have had fewer children than others, often abstaining entirely from motherhood as they simply didn’t have the time for both families and careers (Jones et al. 2008, Baudin et al. 2015).2 Widely accepted economic explanations emphasise that raising a large family requires a lot of time, and time is very expensive for high earners (Becker 1960, Galor and Weil 1996). Over the past 40 years, however, high-income women have dramatically increased their family size and reduced their childlessness rates to become on par with the most fertile population groups (Figures 1, 2). What changed? We argue that rising wage inequality played an important role. As wage inequality increases, high-income households can better afford to have low-income people take care of their children and homes, yielding more time for both careers and families. The rise in fertility of high-skilled females was first documented in Hazan and Zoabi (2015), discussed on Vox here. In a recent paper, we argue that rising inequality, through outsourcing of home chores, can quantitatively explain the observed trends in fertility (Bar et al. (2017). We also study implications for the overall educational investment in children. While we briefly discuss these issues here, we focus attention in this column on one policy implication – increasing the minimum wage substantially decreases fertility and labour supply of high income women. We begin with an overview of inequality’s impact on fertility and education investment in children. Rising wage inequality makes it cheaper for high earners to outsource childcare and household chores, thereby allowing them to increase fertility without sacrificing their career opportunities. This is because outsourcing is directed towards workers that are concentrated in the lower end of the wage distribution, as we explain below. In our paper, we confirm this hypothesis using a structural model of fertility rates and inequality. Our model simulations indicate that changes in wage inequality observed between 1980 and 2010 can indeed account for the fertility trends over time, namely for the dramatic increase in fertility of high income families. Moreover, this hypothesis is consistent with the increased tendency of the rich to outsource time-intensive household chores. The stark implication of the theory described thus far is that any factor that affects the cost of outsourcing home production should impact the families and careers of the rich. Our focus is on the minimum wage. The typical discussion of minimum wage policy focuses on its effectiveness to deliver its intended effect – to raise income of low skilled workers while preserving their employment opportunities (Manning 2016). We point out the presence of an unintended effect on high-income families. If a higher minimum wage makes marketisation more expensive for high-skilled females, it makes it harder for them to afford both a family and a career. While indirect, this effect can be significant. 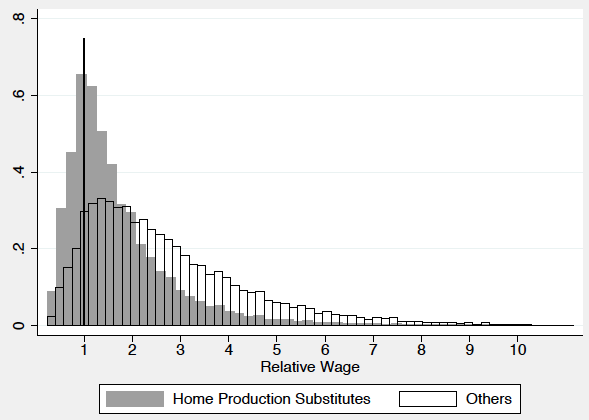 Figure 3 shows the distribution of wages relative to the minimum wage, both for the industries of the economy associated with home production substitutes (HPS) and other sectors of the economy. The figure reveals that wages of workers in HPS sectors are indeed concentrated around the minimum wage. This means they are very likely to respond to changes in minimum wage laws and thereby change the cost of marketisation. Bernie Sanders, during the 2016 presidential election, suggested raising the Federal minimum wage from $7.25 to $15 per hour. To explore how this minimum wage increase would affect high income families, we first need to quantify its implied effect on the cost of HPS4 – this captures the relevant change for high income families whose own wages will not respond to minimum wage laws. The impact of this change on their fertility and market work effort can then be calculated using our quantitative model of family decision making. For our first task, we measure the effect of changes in minimum wage laws across states between 1980 and 2010 on wages of workers employed in HPS sectors. There is, however, a well-known problem with this approach – states tend to raise their minimum wage when economic conditions are good and wages are already rising. Thus, the correlation between the minimum wage and wages of HPS sectors’ workers partly reflects changes in the general economic conditions, rather than the causal effect of policy. To isolate the causal effect of minimum wage laws on HPS wages, we use an instrumental variable approach proposed in Baskaya and Rubinstein (2012). We find that Bernie Sander’s policy proposal to raise the Federal minimum wage to $15 would increase the cost of marketisation by about 20%. How does this increase affect careers and families? According to our theory, higher costs of home production substitutes should decrease fertility and labour supply of high-income women, as outsourcing of childcare and household chores becomes more expensive. We use our quantitative model – which successfully explains the observed time trends in fertility – to estimate the effect of the 20% rise in the cost of marketisation on high-income families. Our simulations suggest a sizable impact. We find that a mother from a 10th (5th) decile household increases time at home by 30% (14%), at the expense of market labour effort. This is specifically for women who have already had children and cannot adjust their fertility choices to changing economic conditions. However, as children become more expensive to raise, fertility rates drop for households that can adjust their family size. 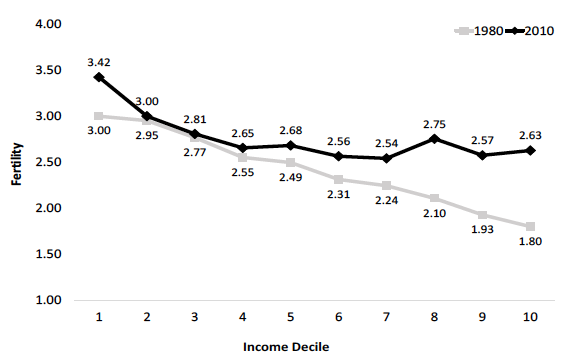 Indeed, we find that a 10th (5th) decile household decreases fertility by 13.5% (9.1%). In turn, these mothers spend only 13% (3.9%) more time at home. These, presumably unintended, consequences of minimum wage policy for careers and families of high skilled women are large. In order to verify this prediction of our model, we also estimate the effect of the minimum wage on the labour supply of high-skilled women directly from the data. We use the 1980-2010 Current Population Survey data on white non-Hispanic married women of age between 25 and 54, and whose real hourly wage is in the 9th and 10th decile. Again, we must resort to the instrumental variables approach to tease out the causal effect. We find that the elasticity of labour supply of high income women with respect to the minimum wage is around -0.4. That is, a 10% increase in the minimum wage yields a 4% decrease in high income women’s labour supply. Our model, on the other hand, predicts an elasticity of about -0.3, which is quite close. Interestingly, when testing the impact of the minimum wage on the father’s labour supply, we find no effect. So, while gender roles have indeed been changing, we do not find evidence that they have been fully equalised. It is important for us to emphasise that our goal is not to argue that rising inequality is necessarily beneficial for educational attainment of future generations, neither is it to argue that increasing the minimum wage hurts high income families. Rather, we wish to emphasise that these ideas represent quantitatively significant tradeoffs that must be taken into account by policymakers. Baudin, T, D de la Croix and P Gobbi (2015), “Fertility and childlessness in the United States”, American Economic Review 105(6): 1852–1882. Bar, M, M Hazan, O Leukhina, D Weiss and H Zoabi (2017), “Is the market pronatalist? Inequality, differential fertility, and growth revisited”, CEPR Discussion paper no 12376. Baskaya, S and Y Rubinstein (2011), “Using Federal minimum wages to identify the impact of minimum wages on employment and earnings across the US”, Unpublished manuscript. Becker, G (1960), “An economic analysis of fertility”, in Demographic and Economic Change in Developed Countries: A Conference of the Universities-National Bureau Committee for Economic Research, Princeton University Press, Princeton, NJ: 209–231. de la Croix, D and M Doepke (2003), “Inequality and growth: Why differential fertility matters”, American Economic Review 93(4): 1091–1113. Galor, O and D Weil (1996), “The gender gap, fertility, and growth”, American Economic Review 86(3): 347–387. Hazan, M and H Zoabi (2015), “Do highly educated women choose smaller families?”, Economic Journal 124(587): 1191–1226. Jones, L, A Schoonbroodt and M Tertilt (2008), "Fertility theories: Can they explain the negative fertility-income relationship? ", NBER Working paper no 14266. Manning, A (2016), “The elusive employment effect of the minimum wage”, CEP Discussion paper no 1428. Mazzolari, F and G Ragusa (2013), “Spillovers from high-skill consumption to low-skill labor markets”, Review of Economics and Statistics 95(1): 74-86. For historical reasons, we explicitly discuss the tradeoff mothers face between families and careers. However, given changing gender norms, the argument made here applies to fathers as well. Baudin et al. 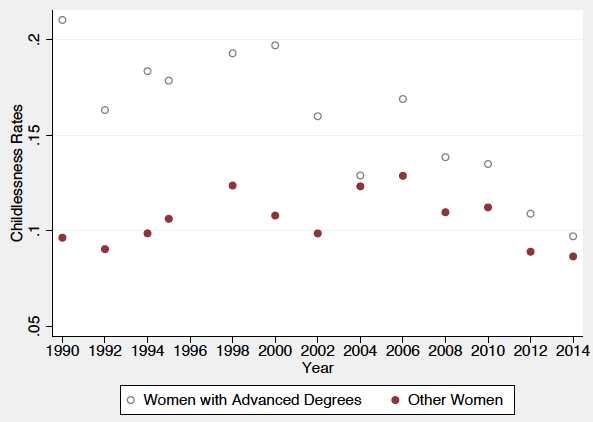 (2015) found that, in 1990, the childlessness rates of women with advanced degrees was more than twice as high as other women. They argue that this was due to the high cost of children on these women’s careers. Without outsourcing opportunities, our model resembles the conventional framework of fertility (e.g. de la Croix and Doepke 2003) and predicts that high income fertility should fall and educational investment drop in response to rising wage inequality. We take the definition of HPS sectors from Mazzolari and Ragusa (2013).